Toasted slices of dark rye bread packed with corned beef, sauerkraut, Swiss cheese and tangy homemade Russian dressing. This sandwich is the perfect reason to make extra corned beef and cabbage on St. Patrick’s Day. Or, simply pick up some corned beef at your favorite deli counter and enjoy a Reuben any time of the year. 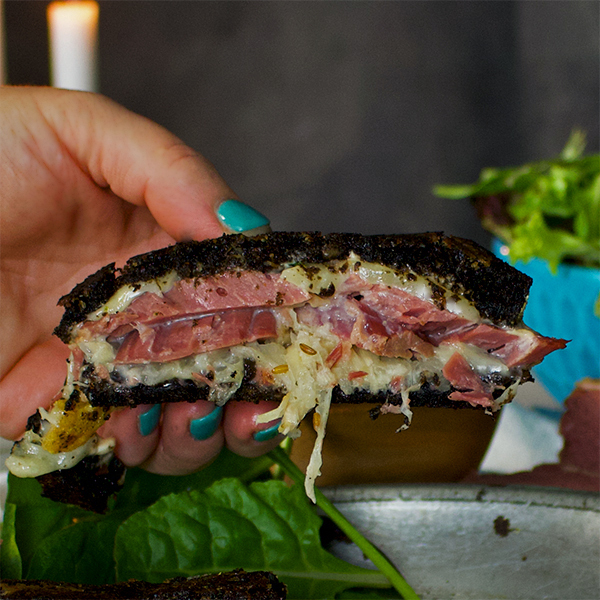 The Reuben Sandwich was possible created in the 1920’s in Omaha, Nebraska, to feed hungry poker players at their weekly game at the Blackstone Hotel. Or, it might have been created at Reuben’s Delicatessen in NYC in the 1900’s. I think it’s possible that both could be true. Two people, in different parts of the country, creating a similar sandwich doesn’t sound terribly far fetched. It probably happens all the time. It’s nice to think that we have original ideas, but as far as I can tell, original ideas are a rare occurrence. 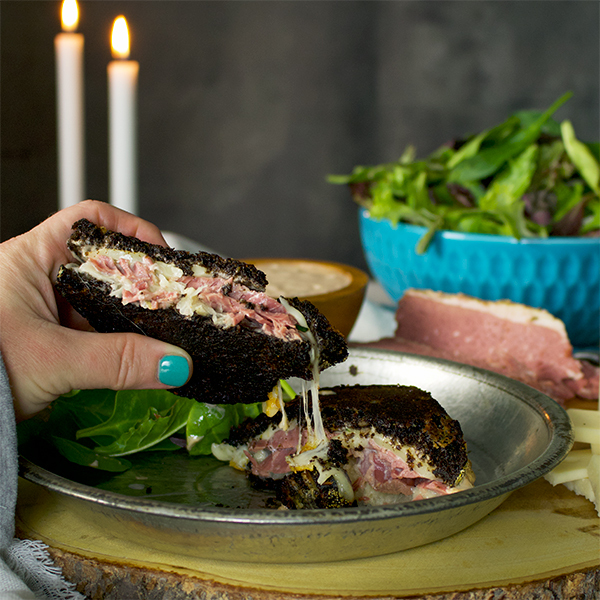 For all we know, Reuben sandwiches were being made by hundreds of people in smaller establishments or home kitchens. The only difference here is that the Blackstone Hotel and/or Reuben’s Delicatessen pushed the sandwich far enough into the public milieu that it caught on, becoming a part of American cuisine. And hallelujah for that because Reuben sandwiches are delicious. The bread. First of all, the bread must be rye – either pumpernickel or dark rye will do. Before assembling the sandwiches and throwing them onto the grill (frying pan), lightly toast the bread to dry it out. The filling ingredients bring a lot of moisture to this sandwich. Toasting the bread keeps it from getting too soggy. The dressing. 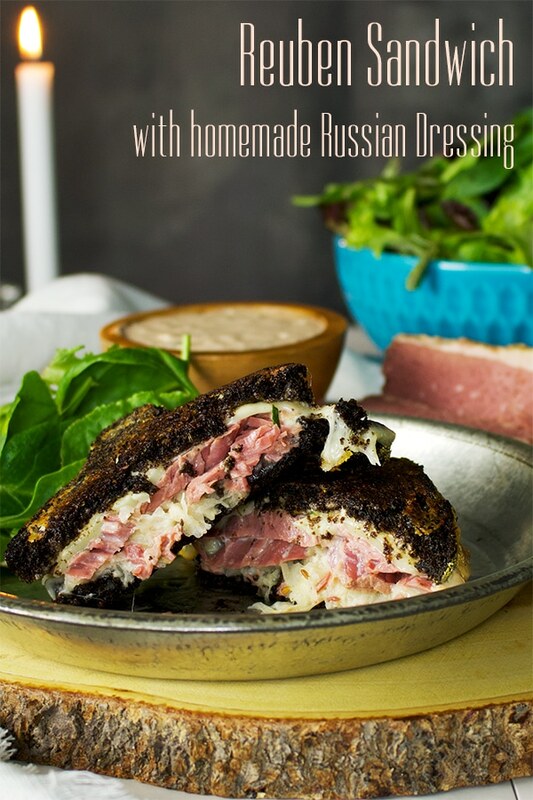 I know Thousand Island dressing is often used instead of Russian dressing, but when it comes to Reuben sandwiches, Russian dressing really is where it’s at. Even better, the dressing is made from common ingredients that I’m betting most of us have in our pantry at any given time. 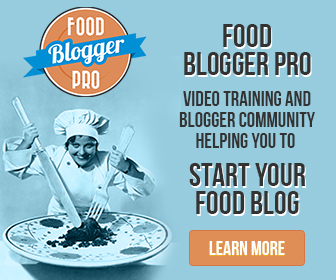 If you have a favorite brand of bottled Russian dressing that you’d rather use, go for it. 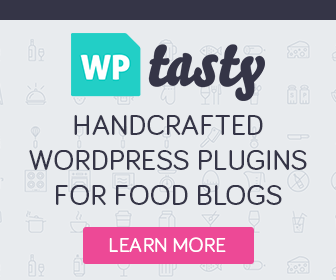 But, making it from scratch only takes a few minutes and allows you to adjust the flavors to your personal tastes. The sauerkraut. My best advice to you about the sauerkraut is to find a good brand. The sauerkraut is a big part of this sandwich – using a subpar brand will matter. The cheese. It’s gotta be Swiss, and in my opinion, should be melted and on both sides of the sandwich. 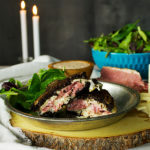 Bread – dressing – cheese – corned beef – sauerkraut – more cheese – bread. Mayo not butter. 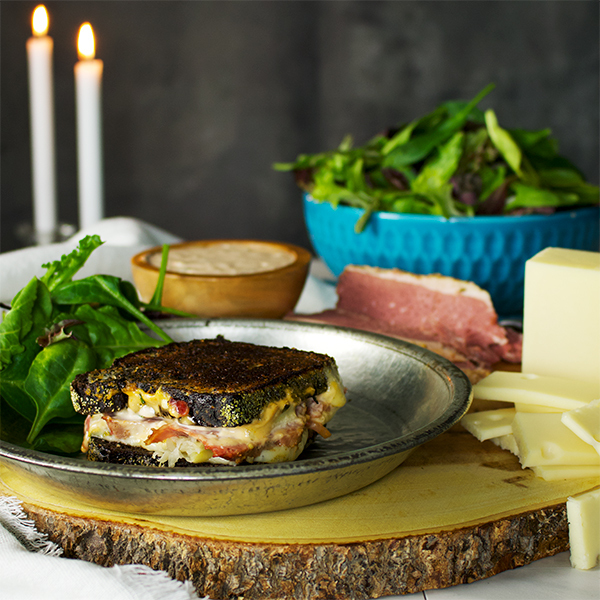 There is a secret to making the perfect grilled cheese sandwich, and it applies to Reuben sandwiches as well. Spread the outside of the bread with a thin layer of mayonnaise before grilling instead of butter. If you’ve never done this, it might sound strange. But, trust me. When it comes to getting a deliciously brown, crisp exterior on your grilled sandwich, mayonnaise is king. Add all the dressing ingredients to a bowl and stir to mix. Taste and add more hot sauce, lemon juice, Worcestershire sauce, or horseradish if desired. Cover and refrigerate until ready to use. Lightly toast all 8 pieces of bread. You want the bread to be toasted enough to feel dry – but not be overly brown. Let cool and then spread one side of each piece of bread with a thin layer of mayonnaise. For each sandwich: Spread a thick layer of Russian Dressing on the inside of one slice of bread and place it mayonnaise side down inside the hot skillet. Lay a few slices of cheese (about 1 & 1/2 ounces) over the mayonnaise, then add about 1/4 lb sliced corned beef. Top the corned beef with about 1/4 cup of sauerkraut and another few slices of cheese. Top with another slice of bread – mayonnaise side out. Cook the sandwich until the bottom is beginning to get golden brown and crispy – about 4 minutes. Use a spatula to lift the sandwich from the pan and use your fingers to flip the sandwich over, placing it back on the spatula. Slice the sandwich back into the pan. Use the back of the spatula to press the sandwich down into the pan, compacting it slightly. Let cook until golden and crispy on the other side – about another 3-4 minutes. Flip the sandwich in the skillet once or twice more, until the outside of both sides is crispy and golden and the cheese is melted.